The only mobile clinic built on years of experience. 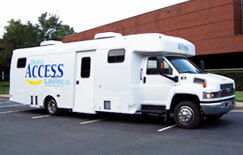 Unlike other mobile vans, Dental Access Mobile Clinics come with all the equipment needed to treat your patients. All our quality-constructed units are designed, assembled and tested to meet the most stringent safety standards. Fast, practice-saving relief after natural disaster. Carry on practice through construction and remodeling. With two fully-equipped treatment rooms, x-ray and many more standard options, Dental Access Temporary Offices are the perfect solution to keep your practice running. 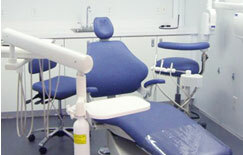 A Dental Access Mobile Clinic is functional and practical because it was designed by dentists for dentists. 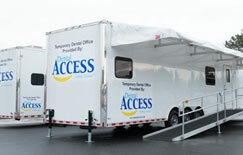 Dental Access Mobile Clinics come standard with all the equipment you need to do what you do best - treating patients! Don’t let your practice come to a standstill. Lease an easy-to-drive Dental Access Mobile Clinic or Temporary Office for the freedom to provide quality care where it’s needed most. The dentist is in the details. From precision placement of equipment to the efficient use of precious space, our dentist-designed units let you forget you’re in a temporary office. A practice-saver during remodel, new construction or when disaster strikes. It’s been shown that dental practices begin to lose patients after just two weeks of stopped service. Leasing offers a great short-term solution. In the case of disaster, insurance companies may even cover the cost.